The highly anticipated bitcoin documentary “Bitcoin: The End of Money As We Know It” has been released today, announced Torsten Hoffman, the film’s writer and producer. It highlights the most interesting use cases of bitcoin and the blockchain technology by avoiding the complex technical aspects of secondary applications. The documentary begins by explaining the problems of current financial systems, including hyperinflation and national debt crisis, to emphasize bitcoin’s benefits and how bitcoin could ultimately be a solution to most of the current financial problems. The documentary was produced and distributed by an award-winning team of professional and experienced television producers. Their films were licensed by international broadcasters and media companies including Neflix, CCTV, Samsung Electronics, Virgin Media, LG Electronics, Sky Deutschland, Orange and minor broadcasters in 20 countries. The trailer is available on Vimeo. The team has included interviews with prominent bitcoin entrepreneurs, investors and authors, including Roger Ver and Andreas M. Antonopolous. “The existing banking systems extract enormous value from society and is parasitic in nature,” Antonopolous explains. The documentary won several international awards, including 2015 Best International Documentary award at Anthem Film Festival (Freedom Fest), 2015 Best Libertarian Theme Film at Anthem Film Festival (Freedom Fest) and 2015 Special Jury Prize at Amsterdam Film Festival. The post Award-Winning Bitcoin Documentary Featuring Roger Ver and Antonopoulos Released Today appeared first on Bitcoin Magazine. The new application from Manuel Aráoz and company was created to build a direct connection between video streamers and their viewers. Video streaming is dealt with on a peer-to-peer (P2P) basis via WebRTC, and payments for viewing a stream are made possible through the use of bitcoin and payment channels. Still, there is still plenty of work to be done when it comes to scaling the software up to handle larger audiences. For now, a broadcaster is limited by his or her own available bandwidth. In any case, here are five types of people who could benefit from trying out Streamium for the first time. The most obvious area where Streamium can be helpful is in the adult entertainment industry, especially when it comes to live cam shows. The adult industry has faced financial censorship from both PayPal and the legacy banking system, which is why many adult entertainment sites have turned to the blockchain for payments. Live cam sites can sometimes take a large percentage of a performer’s profits, which is why the direct payment from the audience to the entertainer on Streamium could be rather helpful. Of course, it would also make sense if the viewers were able to also tip performers for certain requests. Bitcoin isn’t necessarily entirely about illegal activity, but those sorts of profit opportunities seem to be where new technologies take off first. Most sports fans are familiar with free online streams that are usually hosted by shady individuals at a rather low resolution. Viewers are usually bombarded with advertisements when viewing these unlicensed streams, and it also feels like viruses and malware are right around the corner on these kinds of sites. Due to the P2P nature of Streamium, new streaming sports pirates may decide to offer a premium version of sporting events in higher quality without all of the downsides currently found in the black market industry. A variety of “professional-on-demand” services have popped up over the past few years. These are the kinds of websites or apps where you’re able to talk to a doctor (Doctor on Demand), lawyer (LAWfone) or some other professional for a flat fee. Although these services were a move in the right direction when it comes to cutting costs, they aren’t completely necessary in a world of Streamium and social media. Closely associated with this sort of 1-on-1 streaming activity is also the ability to be a freelance consultant on basically any topic without a middleman. Of course, it should be remembered middlemen still have value in these sorts of freelance operations for marketing purposes. The magnitude of online video game streaming may not have become apparent to the general public until Twitch was bought by Amazon for nearly $1 billion, but the large number of young people turning to the video game streaming platform for full-time employment is now becoming hard to ignore. Professional gamers and gaming personalities could use Streamium in a few different ways to improve their overall profits. Although completely replacing Twitch may not be in the cards, streamers could turn to Streamium as a vehicle for pay-per-view events. Whether it is two famous CS:GO teams playing a friendly game or a training session with one of the best StarCraft players in the world, there are a variety of ways in which pro gamers can use Streamium to their advantage. “Teacher” is also used as a rather broad term here as it could be anyone who is able to explain a specific topic to someone else. For example, well-known bitcoin evangelist Andreas Antonopoulos could start a class that can be viewed by anyone via Streamium. Perhaps there would also be a small fee for asking a question at the end of a lecture or presentation. Streamium could allow new students to attend a class without doing anything else besides showing up and opening a payment channel (assuming that they already have some bitcoin.) Perhaps the platform would also be useful for 1-on-1 tutoring sessions between students. In reality, no one really knows how people are going to end up using this new platform. Like many other innovative applications, it is up to the users to figure out how to best use this new tool. Perhaps we’ll see bitcoin conferences or video podcasts on Streamium in the future, but the team behind this new project will need to figure out how to scale the technology – perhaps through webtorrent – before there are any mass events streamed with it. The post 5 Freelancers Who May Use Bitcoin-Powered Streamium to Cut Out Middlemen appeared first on Bitcoin Magazine. We start off with an episode from December 2014 when Dmitry Murashchik of Mycelium was our guest. This week, Mycelium will be shipping out their first, sold-out batch of brand new Entropy devices. Entropy is a small USB device that uses hardware-based entropy to generate printable Bitcoin paper wallets. Find out more about Mycelium and Entropy on Monday’s featured episode of Decentral Talk Live. On Tuesday, we go back to TNABC Las Vegas for an interview with Patrick Cines of the College Crypto Network. CCN is involved in plenty of projects these days, including a Bitcoin Charity Summit at USC. Find out more about how young Bitcoiners are spreading the word about digital currencies in their colleges and communities. Every day on various community chat boards, people ask, “How do I know which wallet is best for me and how do I make sure it’s secure?” CryptoCurrency Certification Consortium (C4) president, Michael Perklin, sat down with co-hosts Anthony Di Iorio and Ethan Wilding to break down the various types of wallets and important steps that users need to take to secure their funds. It’s tax season, so figuring out how to include bitcoin on a tax return is on people’s minds these days. On Thursday, decentral.tv will try to shed some light on a complex issue by highlighting an interview with Jake Benson of LibraTax. Find out more about keeping more of your money while staying on the right side of tax legislation on this featured episode of Decentral Talk Live. Ending the week on a positive note, DTL brings back its popular interview with Connie Gallippi, founder of the BitGive Foundation. Gallippi has worked tirelessly to enable the Bitcoin community to support charitable work by organizations such as Save the Children and the Water Project. BitGive is the first registered Bitcoin charity in the space. It recently formed a partnership with ChangeTip that allows users to automatically redirect their tips to BitGive. BitGive is also part of the 1% Initiative with Purse.io and Chain to save customers money and donate 1 percent to charity. The post Bringing Back the Best: This Week on Decentral Talk Live appeared first on Bitcoin Magazine. This week on Decentral Talk Live, hosts Ethan Wilding and Anthony Di Iorio have a new slate of guests covering topics like tipping, the ways companies get financing and pay employees in the bitcoin space, and the latest developments at Kraken. We’ll start with Justin Maxwell of Tibdit who will answer the questions: What’s a “tib” and what’s a “dit”? And how will Tibdit help to level the playing field, by making the internet more of a meritocracy for content providers? Similarly, Toronto-based http://cryptiv.com/ seeks to make tipping and microtransactions through its online wallet simple and fun. This crypto-agnostic system is designed to work across various social media platforms. Founder Mat Cybula drops in to Decentral Talk Live to chat about the potential cultural impact that social tipping could play in supporting content creators. Finding the right system for paying employees is a challenge for all companies from the smallest start-up to the largest multinational. Adding digital currencies into the mix might seem like just one more headache. But is it really? David Shin from Paywise tackles the ins and outs of salary packaging and outsourced administration services on this episode of Decentral Talk Live. Getting the money to start your new business venture is another financial challenge for new companies. Seedcoin is the world’s first seed-stage Bitcoin and Blockchain start-up virtual incubator. Eddy Travia discusses the ways that new Bitcoin and blockchain businesses can get the support they need to get off the ground. The objective of Seedcoin is “to invest in the creative entrepreneurs of the Bitcoin and Blockchain space and help them develop future services, products and applications” that will re-shape the way people manage and exchange financial and intellectual assets. Jesse Powell, CEO of Kraken, will also stop by to talk about the latest news from Kraken, the cryptocurrency exchange based in Japan. Last November, Kraken was tasked with assisting authorities in their investigation of Mt.Gox and with helping to redistribute recovered assets to its creditors. Decentral Talk Live is a daily talk show hosted by Anthony Di Iorio and Ethan Wilding, along with a rotating panel of guest hosts. It airs on decentral.tv, Monday through Friday, at 3:00 pm, EST. The post Talk about Tipping: This Week on Decentral Talk Live appeared first on Bitcoin Magazine. Leading up to Bitcoin Women’s Day, decentral.tv aired episodes that addressed some of these concerns. On Tuesday’s episode, Tatiana Moroz discussed her role in helping to found the Women’s Crypto Association. She noted that there are few women in venture capital, which influences how projects are funded. “Men value things differently than women. More diversity in the venture capital space will lead to more diversity in the products that are created and the companies that are born,” she said. Moroz encouraged more women to join the Women’s Crypto Association. She objected to the way that many conferences relegate women speakers to a “Women in Bitcoin” type of panel. Decentral Talk Live also featured a conversation with Connie Gallippi, whose BitGive Foundation is the first charity to receive 501(c)(3) nonprofit status. The type of projects that BitGive work on include Save the Children, which now accepts bitcoin directly; the Water Project, which brings clean and safe water to sub-Saharan Africa; and Medic Mobile, which uses mobile phones and open source software to improve healthcare in the developing world. Gallippi recently has been to Africa to see a well that BitGive funded entirely through bitcoin donations. In co-operation with BitPesa, a short video is being produced that chronicles the Water Projects’ bitcoin-funded well and looks at the future social impact of bitcoin in developing countries. “The technology is there but we just need to build out the infrastructure and user base,” says Gallippi. The week ended with an interview with Anne Connelly, director of marketing and fundraising for Dignitas International, a charity that aims to transform healthcare for the most vulnerable. Dignitas delivers frontline care in Malawi, conducts research and develops practical solutions and advocates for better health policy and practice. Connelly recently succeeded in convincing her boss that bitcoin could be a valuable addition to their fundraising goals. It wasn’t easy. She had to overcome the organization’s fears of the unknown, not to mention bitcoin’s notorious volatility. Connelly had to “come up with a better way of thinking about it,” and finally, through her repeated efforts, she was able to convince Dignitas to accept bitcoin donations in the same way that it accepts stock donations. Donations help the foundation keep babies HIV-free, keep young people with HIV/AIDS on treatment and boost maternal health. All three of these women have been instrumental in raising awareness about bitcoin and the way it can have a positive impact on society – as well as the ways in which women are making a difference in the Bitcoin space. 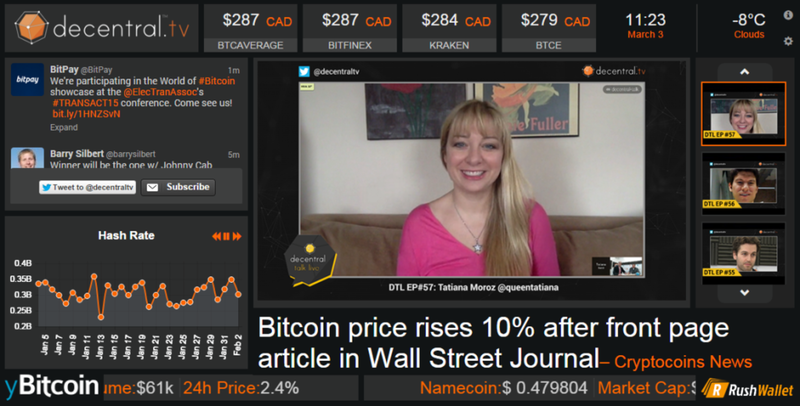 The post Recognizing Women in Bitcoin – The Week in Review from Decentral.TV appeared first on Bitcoin Magazine. Another woman making a point of incorporating bitcoin into charitable giving is Anne Connolly, director of fundraising and marketing at Dignitas International and fundraising manager and director of marketing at Médecins Sans Frontières/Doctors Without Borders Ireland. Through her work with Dignitas International, she has helped to raise funds for the Tisungane HIV/AIDS Clinic in Malawi. Anne also addresses the increasingly important role of bitcoin in Somalia, a country with a huge remittance market. 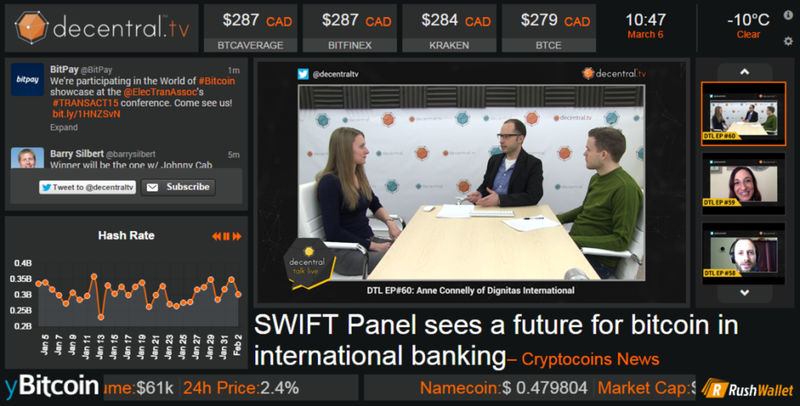 Other guests this week include Flavien Charlon, Founder and CEO of Coinprism, who introduces viewers to the world of colored coins; Radislav Albreicht of BitBond, a peer-to-peer lending platform that allows borrowers to access affordable funding without needing a bank, while lenders earn higher interest rates on their savings; and finally, the always entertaining Tatiana Moroz, bitcoin evangelist, singer/songwriter and author. The post Bitcoin Giving Back: This Week on Decentral Talk Live appeared first on Bitcoin Magazine. Decentral Talk Live features a diverse collection of guests this week from all over the decentralized and disruptive technology community. Topics include security and regulatory compliance, publishing, branding, web-development, and building features on top of the Bitcoin blockchain. Balancing security and privacy with regulatory compliance is a tricky business when it comes to digital currencies. This week, DTL talks with Amber Scott, founder and “Chief AML Ninja” of Outlier Services. Scott is a Certified Anti-Money Laundering Specialist (CAMS) and a Certified Privacy Professional (CIPP) with a degree in psychology from the University of Waterloo, where she helped develop the first applied psychology course on criminal profiling. In 2013, she founded Outlier Solutions to provide AML and CTF compliance for financial services (including casinos, insurance, accountants, real estate, securities/investments, digital currencies and more). Among other security-related topics, Scott delves into the complex world of financial regulation and gives tips on dealing with banks — always a tricky problem for Bitcoin companies. Craig Sellars, the CTO of the Mastercoin Foundation, joins DTL to discuss its communications protocol. Mastercoin uses the Bitcoin blockchain to enable features such as smart contracts, user currencies and decentralized peer-to-peer exchanges. A common analogy used to describe the relation of the Master Protocol to Bitcoin is that of HTTP to TCP/IP. Like the Master Protocol, HTTP is the application layer for the more fundamental transport and internet layers of TCP/IP, such as Bitcoin. As co-founder and CTO of Tether, Sellars also answers questions about this fiat currency token platform on the Bitcoin blockchain. Tether aims to provide a quick and secure way to store, send and receive real-world currency as if it were bitcoin. 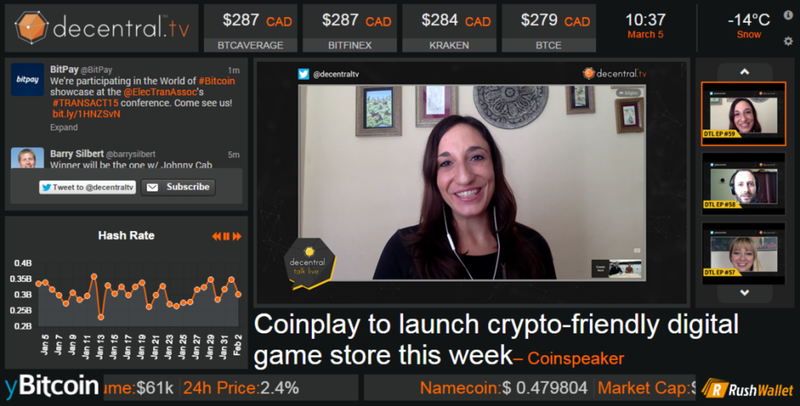 Themes for this week will also include communication and marketing in the Bitcoin space. Rik Willard, CEO of MintCombine, a think tank and product lab delivering blockchain solutions for brands and causes, will talk about the challenges of navigating the complex economic environment of emerging decentralized digital engagement ecosystems. Mitchell Callahan, Founder and COO at Saucal, will provide insight into his Bitcoin & web application development firm. Jeffrey Tucker, Chief Liberty Officer of Liberty.me, a subscription-based, action-focused social and publishing platform for the liberty minded, will share his enthusiasm for sharing and promoting ideas that support freedom. Decentral Talk Live airs new episodes at 3 pm EST, Monday through Friday, on decentral.tv. The post This Week on Decentral Talk Live appeared first on Bitcoin Magazine. Bitsquare is an open source, completely decentralized bitcoin exchange. Founder and developer, Manfred Karrer, discusses his project and his ideals with Ethan Wilding and guest host, Hai Nguyen. Bitsquare is based on the concept of “no single point of failure” and decentralization. Karrer also discusses the concept of peer-to-peer arbitration. Other guests this week will include Gerald Cotten of the Canadian exchange, QuadricaCX, as well as Mitchell Callahan, founder of Saucal, a marketing and brand development company that integrates bitcoin into its clients’ growth strategies. Check out past videos at decentral.tv.